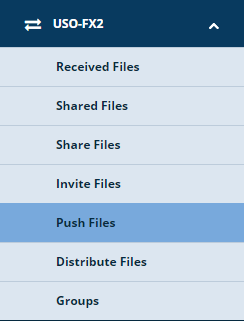 Browsing articles in "Free tutorials"
The Push files feature allows you to share files securely with individuals who may not have a USO account but with whom you need to exchange sensitive information. In order to share a file with someone via this method, all you need is their email address and their mobile phone number. Enter the recipient’s correct email address and their mobile phone number. Both elements are essential! The recipient will receive an email link from which to download your file and a text message will provide the code they need to enter in order to begin the download. After entering their details you will need to upload a file. If you wish to send the same file to multiple recipients use the Add More button to add people to the list. Each person will then be able to download the file for themselves. Select a file either by finding it on you local device or network, or alternatively, share a file that you already have stored in your myDrive space. Enter the recipient’s details as described above. Then, instead of selecting the first option to upload a file, select the second option to turn a text message into a file. Click Next to enter the message. Now enter the message into the text box on your screen and click Push as file when done. The message will get converted into a text file and will be available to the recipient to download as a separate document. Please note that the recipient will be able to download by using the link in their email and activating it by the code they enter. The link will then remain active for 5 minutes only. If for any reason you need a history of files you’ve previously shared via the “Push file” feature, a list of all past files will be available at the bottom of the page. The codes issued with each file will also be visible in case the recipient has lost or has not received the text. You will be able to provide the code again if needed. If your username is not on the list of users on the helpdesk, please raise a case under someone else’s name and request that you be added. Each school has two bespoke internet homepages – one for Staff and the other for Pupils. Each page has a link to the school website, a Google Safe Search searchbar and a number of hyperlinks to various online website resources specific to each school. The hyperlink grid underneath the search bar can be customised. If you require any links to be added or removed, please raise a support case detailing which sites you want added or removed and whether they are to be added to the pupil page, staff page or both pages. We will confirm these changes with the ICT lead at the school and get the changes underway. Much of this content comes from Google support. By putting double quotes around a set of words, you are telling Google to consider the exact words in that exact order without any change. Google already uses the order and the fact that the words are together as a very strong signal and will stray from it only for a good reason. The Share files feature is designed to allow USO-users to share files securely with any other USO account holders within their school, in other school, in the Local Authority, or any other establishment that uses USO authentication.